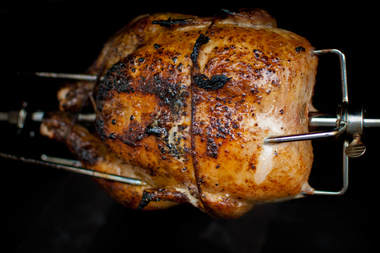 Poulette will serve French-style rotisserie chicken on Ninth Avenue. HELL'S KITCHEN — A new chicken joint hopes to bring a bit of Paris to Ninth Avenue. Poulette, which will open at the end of April at 790 Ninth Ave., will serve the sort of traditional French rotisserie chicken that's a staple of Gallic cities. The tiny 12-seat restaurant is the brainchild of Adam Jama, 28, who grew up eating the roasted bird in Paris. "It's a real tradition in France, especially on Sundays, to go to one of the many small rotisserie shops," Jama said. "People come and get a chicken and some potatoes, bring that home, gather together and eat it." Poulette's antibiotic and hormone-free chickens are all raised on free-range farms in Upstate New York. They'll be roasted in a specialty 30-chicken rotisserie that Jama is importing from France. Each chicken will take about an hour to cook, with potatoes roasting underneath, sucking up succulent juices for added flavor, Jama said. 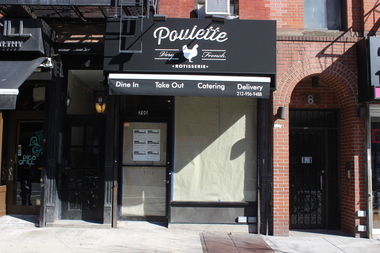 Poulette will open at the end of April at 790 Ninth Ave. The menu prices haven't been set yet, Jama said. Jama, who previously worked in finance in Midtown, has been planning to open the shop for about a year. With 12 seats, it will mostly be for takeout and delivery, and he hopes to attract some of the Midtown office lunch crowd, along with locals living in the neighborhood. Along with the potatoes, the restaurant will serve sides like Brussels sprouts, cauliflower, green bean casserole and ratatouille. "We're serving a rotisserie chicken sandwich that's going to be awesome, and a salad as well," Jama said. For the dessert lovers, there will be a daily selection of homemade French tarts. "Everything's very simple, very healthy, homemade," Jama said. "Everything, all the recipes, are going to be very French."